Alzheimer’s Research UK commissioned my former colleague Trina Wallace www.trinawallace.com and I to create their 2012 print and online annual reviews. 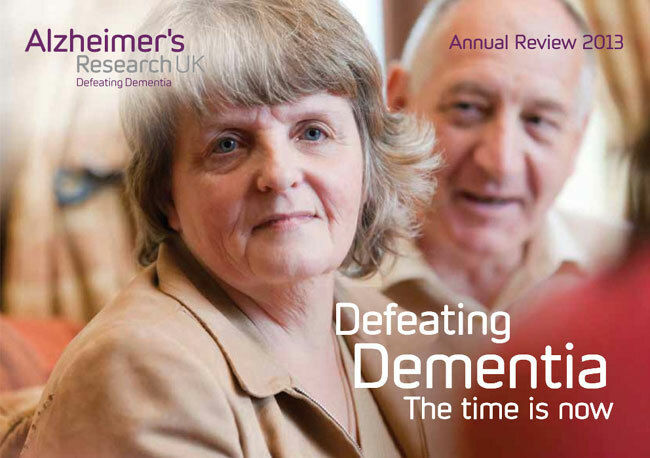 To create an annual review that would show funders, donors and politicians the impact of Alzheimer’s UK’s work, and encourage them to give money and support, form corporate partnerships or volunteer. Urgency was a key message. If we don’t fund research to slow and cure dementia now, the number of people affected will double in a generation. Yet dementia research doesn’t attract nearly as much funding as other diseases. The publication had to show the impact of charity’s often complex research projects simply, succinctly and powerfully. We had to use jargon-free language anyone could understand and bring dry topics to life. At the same time, we wanted to give the annual review a human face, showing the impact dementia has on people with the disease and their families – and how more research could improve their lives. We came up with a concept and content plan for the print publication featuring a mix of case studies and stories of inspiring research projects. We visited scientists and people affected by dementia from Edinburgh to Southampton, writing up their stories into concise, compelling copy. Working with a camera crew, weinterviewed some of the case studies on screen, creating short videos for the online version of the annual review. We came up with a content plan for an online version and edited the print version accordingly. A powerful publication succinctly showing how dementia can devastate people’s lives, how research is helping – and why more funding is desperately needed.